Venerable Tenzin Tsapel was inspired to become a Buddhist after she met Lama Yeshe and Lama Zopa in 1979. She was ordained five years later by H.H. the Dalai Lama. 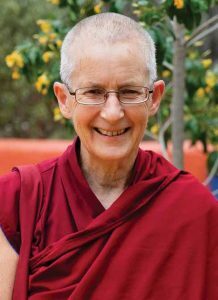 Tsapel served as a resident teacher at FPMT Centres in Sydney, New Zealand and in Mongolia. She also taught and/or tutored at the Chenrezig Nuns Community in QLD for seven years. Venerable Tsapel has led many group retreats and completed a number of solitary retreats including a two-year calm abiding (mindfulness) retreat on Kangaroo Island after attending a group retreat led by Alan Wallace. Currently, she is establishing a nunnery in Bendigo, Victoria. We invite you to attend her teachings and/or workshops as outlined below and encourage you to book and pay online in advance so we can manage seating arrangements. Some of the sessions are restricted and can’t be booked online. See details below. Please note that we have significantly reduced the price for attending all sessions. Sangha are admitted free of charge and should contact our SPC beforehand on 0422337524. We encourage you to attend all 3 sessions at a discounted price but you can also book each session separately. Anger is strong. Anger is destructive. It destroys your happiness in this and future lives and can have a devastating effect on those around you. Learn techniques to deal with the anger of yourself and others. Lama Yeshe said: “Attachment is so sensitive. Something small happens and you freak out. That’s all attachment; that’s the attachment trip”. Learn about attachment and how it impacts on your life. Our mistaken way of perceiving ourselves, others and all phenomena is the root cause of all our problems in this and future lives. Overcoming this ignorance is the atom bomb of the Buddha’s teachings. Rituals and prayers help transform your mind to a more conducive state to meditate, listen to teachings, or undertake spiritual practice. They are particularly effective if you understand the psychology behind the practices and what they are trying to achieve. This session can cover practices such as prostrations, mandala offerings, altars and water bowls, prayers, visualizations, meditation postures, food dedication or anything you want to ask about. Too often our minds are weighed down by anxiety, doubt, self criticism and other negative thoughts that make us unhappy. This workshop will help you understand the origin of these negative minds and show techniques on how to deal with them. *Prerequisites: participants must have the initiation to do the first part of the practice and completed the retreat and fire puja for the second part. Please contact the Spiritual Program Coordinator on 0422337524 about your eligibility. This workshop can’t be booked online due to the prerequisite. The Buddha taught that since unhappiness is a mental state, the primary cause for peace, free of disturbing states, is also found within the mind. Work with your mind, using shamatha (mindfulness) meditation, instruction and discussion to develop mindfulness and wisdom. An overview of Six Session Guru Yoga and vows in this discussion and Q&A session. By donation. *Prerequisite: participants must have a higher tantric initiation. Please contact the Spiritual Program Coordinator on 0422337524 about your eligibility. This workshop can’t be booked online due to the prerequisite. Please note that the discount price for booking all sessions only applies if you book ALL the non-restricted sessions. A booking for one person may not be shared, is not transferable and is not refundable, however, if you cannot attend a session you have booked, please let us know (welcome@hayagriva.org.au) to help us manage the number of seats. Attendance to restricted sessions is by donation and cannot be booked online. When attending, donations can be made using EFTPOS. Just ask one of our staff to assist. Sangha are admitted free of charge. We ask that you contact our SPC so we can manage seating.